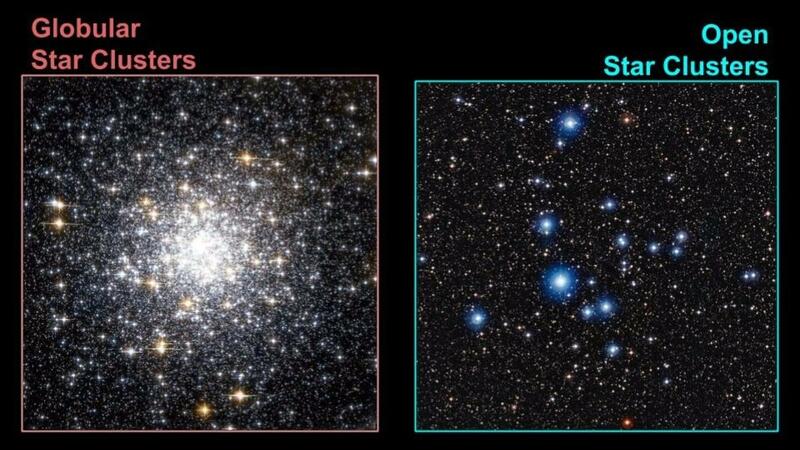 Let's examine the two types of clusters….globular star cluster and open star clusters. Globular clusters are spheroidal shaped groups of stars, while open clusters do not have a definitive shape. But there is much more to these groupings of stars than meets the eye. As their name suggests, globular clusters are globule-shaped balls of hundreds of thousands of stars all crammed into an area a few hundred light years across. They live in the halo of our galaxy and orbit the galactic centre. They are very old, at 12 to 13 billion years, while a few form the cores of smaller galaxies that have been taken over by the Milky Way. Messier 13, is an example of a globular cluster located in the constellation Hercules. It is the brightest globular cluster visible in the northern hemisphere and it is located right along the edge of the Keystone in Hercules. To the naked eye it appears as a fuzzy patch, but it with a telescope or binoculars it can be seen more clearly. This cluster is estimated to be 145 lights years across and contains 300,000 stars. Open clusters do not have a definite shape. They are younger, contain second generation stars which are often hot and blue, and live within the disk of our galaxy. An example of an open star cluster is the Pleiades, is a fairly young open star cluster. It is located approximately 415 light years away, and it probably one of the most famous star clusters, and for good reason. This beautiful cluster appears to be a group of about six stars to the naked eye, but when magnified, many more stars are revealed. The name Pleiades comes from the Greek work ‘plein’, which means ‘to sail’. This cluster was very important to ocean-fairing navigators, and it was used to help sailors determine the best times to sail the Mediterranean Sea. When you go outside, try scanning the sky for these two different objects. Record what you see, and compare it to a book or resource to see if your observations match.